The other evening I was feeling like having something light with our dinner. 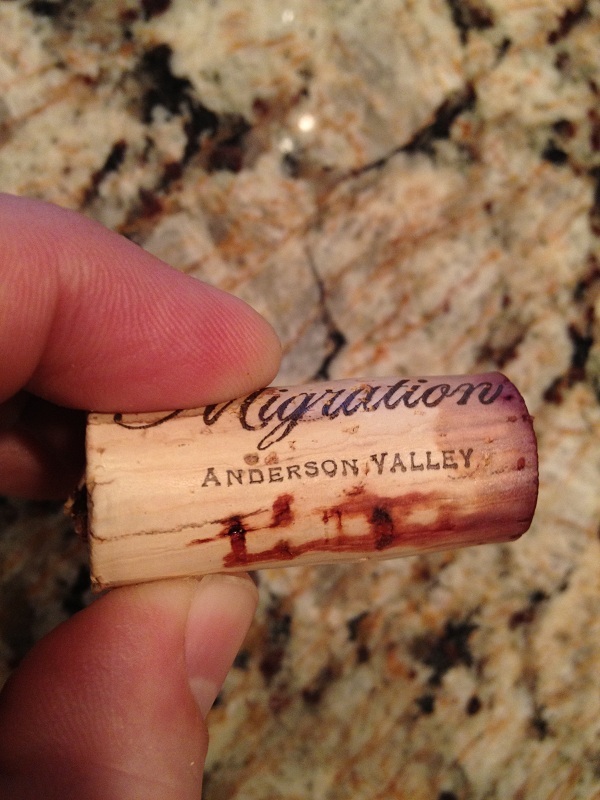 Wandering through my cellar I found a bottle of 2006 Migration from Anderson Valley. I could not remember the wine until I looked at the back of the bottle. Chris and I visited the Duckhorn tasting room in Napa Valley some time ago along with some friends. 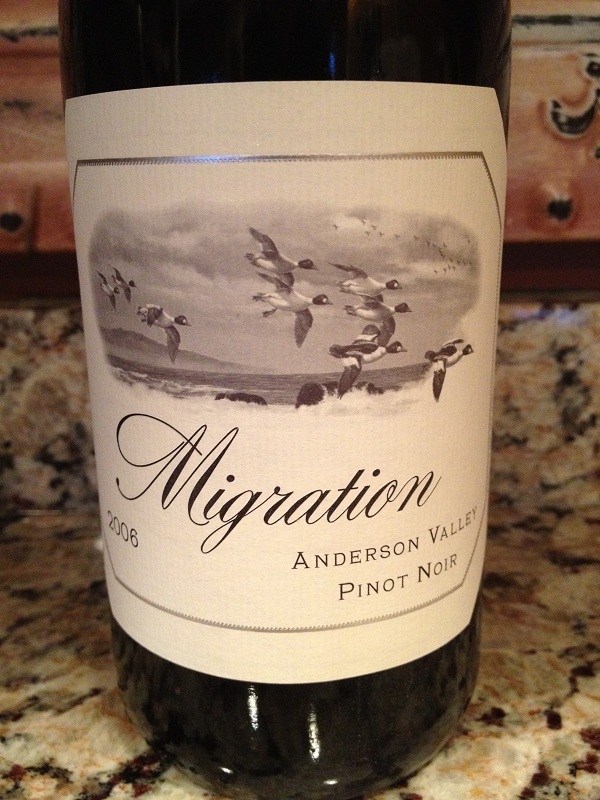 Migration, is a second label from Goldeneye winery who is part of the Duckhorn wine family. We have not visited the Goldeneye tasting room. As I reviewed the website, I learned that they are located in Philo, California which is 102 miles from St Helena, California. It appears that if we would like to visit the tasting room that it’s going to be a days event. The label on the front of the bottle was interesting. Goldeneye was depicting the seasonal migration of the Goldeneye duck that resides along the Pacific Coast, and it states that the art is an original. I cut away the seal on the top and pulled the cork from the bottle. Examining the cork it was showing something interesting. As you can see from the picture, the wine had worked itself half way through the cork. I squeezed the cork and it was pretty rubbery. It seemed that it was the right time to drink the wine. As I viewed it, it had a light purple tint and the edge of the glass was a bit of golden color; and then clear. You could see the contrast of the color moving from the center to the edge of the wine. As we smelled the wine it had hints of cherry, a slight smell of apple, and strawberry. Taking my first sip, I found it sweet and very soft. Tasting the wine I could taste caramel and it had a soft cocoa type of finish. 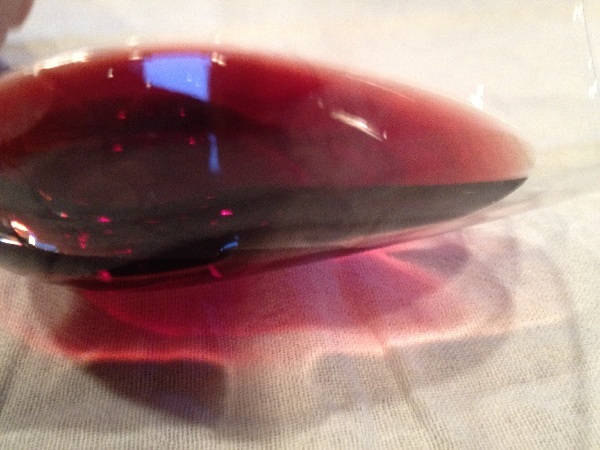 The light tannins approached my mid palate and back of my tongue. There was a long soft finish. This wine was excellent! Chris told me this had to be her most favorite Pinot she has tasted! As the wine sat in the glass over time it truly just got better! If you have an opportunity to buy this wine we would definitely give it two thumbs up! !